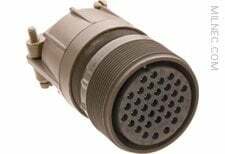 A connector’s shell is the outer casing in which the vital components of the connector, such as the contacts and insert, are housed and protected. A mated pair consists of two shells: one plug and one receptacle. Plugs are typically straight or at a 90° angle. Receptacle shells come in four basic styles (wall mount, box mount, jam nut, cable mount) to provide various mounting options for your particular application requirements. Thru-bulkhead receptacles are also available for applications requiring a feed-through on bulkheads or panels. A plug terminates at the end of a loose cable and mates with a corresponding receptacle. Its coupling ring, the plug’s most defining attribute, facilitates positive mating onto the receptacle. Standard receptacle with a four-hole flange for front or rear mounting through a panel or bulkhead. This popular receptacle style includes accessory threads to accept a backshell. Preferred for their superior environmental seal due to an integrated O-ring and a single-hole mount design. Jam nut receptacles decrease the number of environmentally susceptible openings in an enclosure. A single hex nut (“jam nut”) locks it in place rather than bolts. Designed for rear panel mounting only. For feed-through of circuits on bulkheads or panels. These specialized receptacles have a receptacle on both ends of the shell. A plug with a 90° elbow on the backshell allows mounting in confined spaces. The 90° angled backshell may be rotated and locked at any 45° increment for improved cable management. Box mount receptacles have the same flange design as wall mounts. However, box mounts do not come equipped with accessory threads, which allows for a more compact rear profile. Used almost exclusively for extension cords, cable mount receptacles terminate directly at the end of a cable. They are also used when equipment boxes are not easily accessible, making cord mount receptacles the only option.